This Braised Pork and Shrimp dish is a delicious example of the bold flavors intrinsic to Vietnamese cuisine. It’s an easy dish with simple ingredients but is truly unique tasting. Braising or “Kho” is a popular Viet method for cooking savory meat dishes. The cooking technique allows the meat and shrimp to absorb the savory and slightly sweet sauce as it is cooked. Caramelizing the sugar first and then adding fish sauce produces a glossy sauce which adds beautiful color to the dish. The best part about this recipe is how quickly you can make this dish. (You can definitely add this to your 30 minutes or less recipe category.) The prepping is minimal and you can often find the pork already cut to size. For convenience, buy shrimp that’s already cleaned–peeled and deveined. The rest is a breeze! 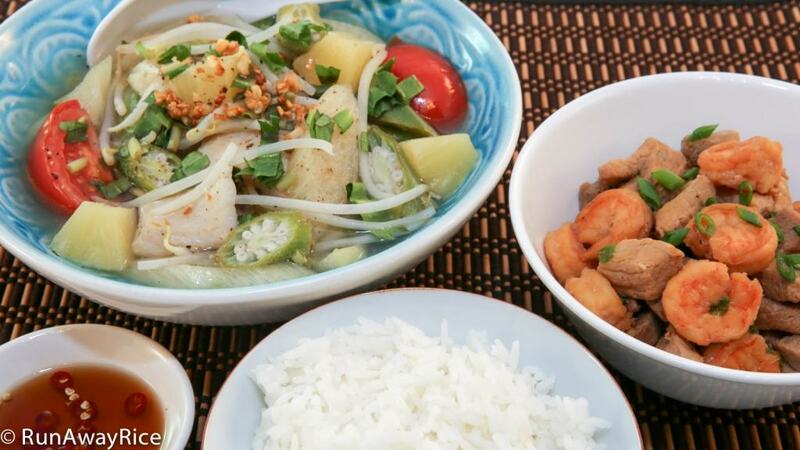 Want to make it a traditional Viet meal? Serve this dish with Sour Soup (Canh Chua). Chop the tops of the green onions and set aside in a small bowl. Finely mince the garlic. Peel the shallots and finely chop. Set aside in a small bowl. Cut the pork into strips about 1/2-inch thick. Heat a pan over Medium High heat and when hot add 1/2 Tbsp vegetable oil. Add 1/2 Tbsp sugar and quickly stir together. 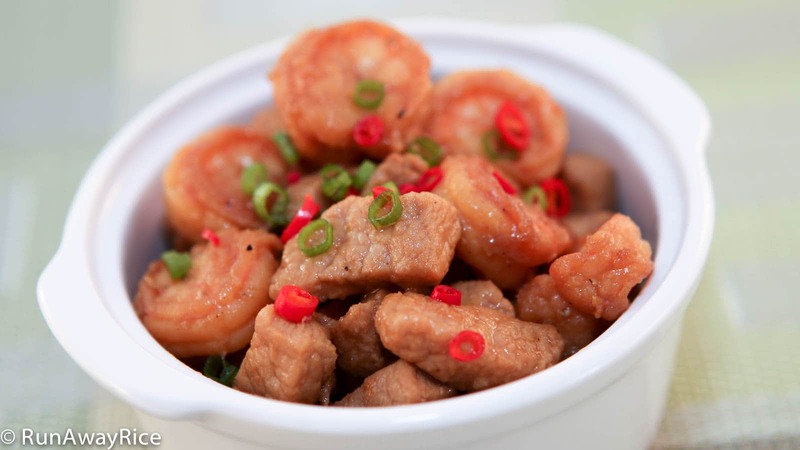 After the sugar dissolves and turns a honey color (approximately 30 seconds), add the shrimp and stir-fry for 1 minute. Transfer the shrimp to a clean plate and set aside for now. Heat a clean pan over Medium High heat and when hot add 1 Tbsp vegetable oil. Add 1 Tbsp sugar and quickly stir together. Again, after the sugar turns a honey color, add the garlic and shallots and stir-fry for 30 seconds. Add the pork and stir-fry for 1 minute coating the meat in the caramel sauce. Add the water and combine. Cover the pan and cook on Low heat for 5-6 minutes. Add the shrimp and fish sauce to the pork and combine well. Cook for another 5 minutes until most of the liquid is evaporated. Before serving, top with the chopped green onions.